As mentioned somewhere else here, I have shown sporadic interest in bands who might fall under the Britpop banner. I was an enthusiastic fan(to varying degrees) of the Stone Roses, Inspiral Carpets and the Wonderstuff . I did own some Blur on cassette, and eventually picked up some Oasis. I less au fait with the more recent aspirants to Britpop royalty. I missed the Arctic Monkeys bus somewhat. I was there early on for the Kaiser Chiefs however. Perhaps it was their clever decision to name themselves after a South African soccer franchise, but mostly likely it was the gushing praise they received in the press upon birth. Not surprisingly a number of my reviews begin with some variation of “I was at a festival and spied…”. I say not surprising, because discovering new acts is very much a festival raison d’être for me. K’Naan well and truly fits that bill. A few days in at a Bluesfest we sort refuge at a smallish indoor tent and were mightily impressed by this Somalian Canadian fellow and his wicked rhyming. K’Naan showcases a real breadth of skills and styles on here. He shifts from pared back a capella and spoken word pieces, to much more bombastic rocky numbers. He isn’t afraid to break into song. His roots in poetry and more traditional African music (of course, rapping shares these roots) are apparent. This is hip-hop at its story-telling best. It is not a ‘background music’ album, but rather a strong testament to the spread and power of the hip-hop format. The discussion of children’s records reminded me I’d missed a J LP. When flicking through record racks in second-hand stores, I find it very, very hard to resist old vinyl gems like this. That dance with the tree is probably something that wouldn’t get past the prudish studio types these days. This album, which only has nine tracks pulled straight from the film (dialogue and all), showcases the audacity of this film. It is filled with swinging bebop explorations, skatting, Gilbert & Sullivan-esque nonsense and class commentary, some lovely orchestration and one of the funniest Beatles impersonations you’ll ever hear (as hippie vultures no less). It is a reminder that Pixar didn’t invent animation that adults could delight in, and that such films can be made without any use of Elton John or Randy Newman. One last pre-K review (actually, I’ve just remembered another J I own – so this is second last!). I am without children, so I am typically spared the perils of navigating the murky world of children’s music, bedevilled as it is with much that is cloying, aggravating, embarrassing and downright painful. Sure, there a little nuggets of gold courtesy of them fine folks at CTW (oh, and a J record I should go fish out! ), but I am spared all the merchandising masquerading as music that seems to clutter the lounges of so many parents I know. Nevertheless, I somehow thought it would be a good idea to check out this little ‘family album’ from Kasey, her Dad, and various of their infant family members. I played it once upon purchase, shelved it, and was only reminded of its existence by Kasey’s newie, and also seeing Bill and KC performing a track off here (Dad, Do You Remember?) live on stage. There are also a lot of mentions of Aussie fauna. I’m guessing it’d work for the 3-6 year old market, and while I am immature, I’m not that spritely. File under: A Christmas pressie for the little jackaroo/jillaroo in your family? We’re currently watched the new New Orleans based TV series from the ‘Wire’ gang – ‘Treme’ – and rejoicing in its musical focus. A thrill from episode 4 was the sight of Justin Townes Earle and his facially hirsute pa Steve, playing the role of French Quarter buskers. In a perfect world, every single person watching the show would have been going ‘there’s Justin’ in the fashion I was. This young man should be a superstar of the first order. This, his third album, continues his evolution into a fully fledged member of my country 1st class (i.e. alongside Lucinda, Gillian, Johnny Cash, Steve, Hank…). While in the past I’ve lauded the ‘olde worlde’ skills of JTE, on this record he strides more confidently into the latter part of the 20th century. There is much less bluegrass, replaced by warm, occasionally gospel-like tunes. The title track is a ripper, with a surprisingly upbeat suicidal narrative. There’s a luscious lament to lost love in NZ (Christchurch Girl). And he plays to my love of railway-songs onWorkin’ for the MTA. JTE’s on his way down under again in March 2011 (for the Golden Plains festival, but hopefully playing sideshows aplenty). Go see him (I’ll be stalking him in NYC not long after). There was much excitement around our abode at the news of a new Chambers album. Here is an artist who unites my wife, my mother-in-law and I in mutual admiration. I was surprised, once I thought about it, how long it’d been since a genuine solo Chambers album. She’d been off collaborating (very successfully) with her hubbie, and also did a children’s album I need to review also. I’d call this CD a return to form, if it wasn’t for the fact that KC hasn’t really dropped the ball along the way. Instead this album should be seen as the latest installment in her evolution, whole also capturing much of where she’s been before. 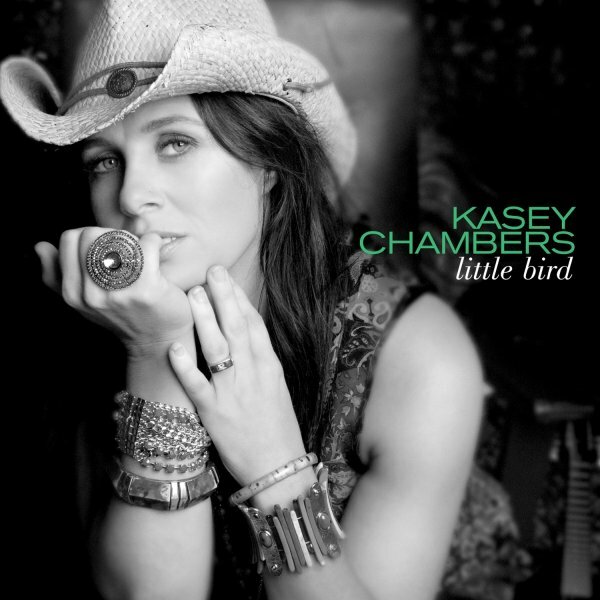 It is an unashamedly country album, but with a modern-pop twist when it takes her fancy. She rocks out superbly on a couple of tracks (Train Wreck is a standout), but also experiments with some old-time bluegrass on a track you’d swear she dug up from some traditional songbook (Georgia Brown – she also reworks the tailend of Train Wreck into a banjo-fuelled tune). Before we launch into the letter K, I need to catch you up on some recent purchases from the land of A-J. Despite my pretty extensive Nick Cave collection, I was slow to jump on the Grinderman side-project. It was only when the band’s second album came out last month that I picked this up going cheap at JB HiFi. And was just the sort of raw rock I’d been looking for. Over the years, I’ve found great joy in the moments when Nick and his highly talented buddies have reminded us that they can let it all hang out, that there doesn’t need to be too much structure, control or pretence to their sonic adventures. The sheer number of band members, and instruments (especially that piano) have made that a very tough balancing act in Bad Seed land. The Grinderman set-up with its stripped line-up, and Nick on guitar, allows a lot more free-form, balls out, garage rock. It’s all rather rough and ready, but with that trademark Cave (and maybe Warren Ellis’ influence) tongue in cheek.